Breaking up is hard to do, and everyone here is going through it. Everyone. Think of it. An entire population breaking up. Things are a mess. 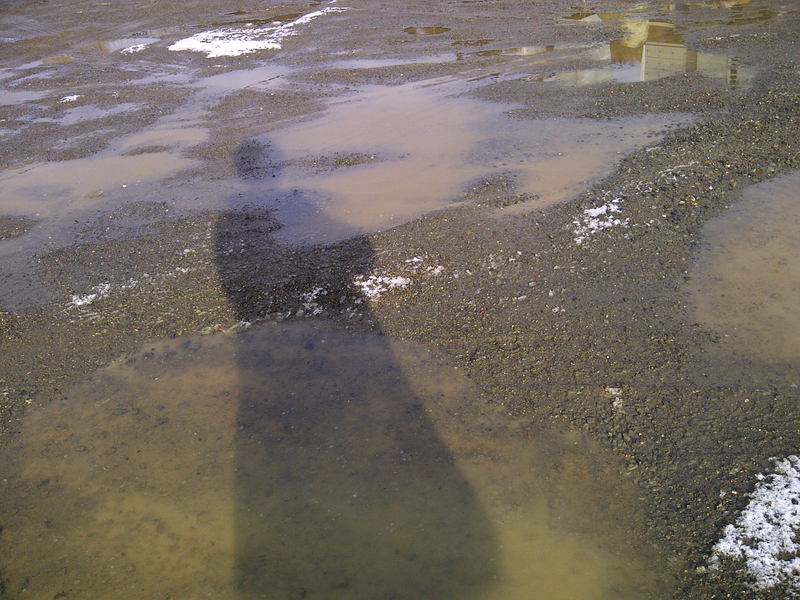 Snow is melting, re-freezing, an ugly chocolate frosty oozes down the street beside my apartment building. March is the top month for suicides in Alaska, I hear, but there is now this incredible sunshine, tonight it’s bathing the Kenai Mountains I can see outside my window. There is every good reason, past break up, to keep going. Several people doubted me this week when I mentioned that Daylight Saving Time begins this weekend. It seems early in the calendar, but Google can’t be wrong; it’s right there in red letters, and I didn’t add it as an event. Further validation came this morning from the University of Alaska, which used its emergency alert system to remind students to set their clocks ahead one hour–and to replace water stored for emergencies and smoke detector batteries. I don’t have emergency water, and the smoke detector in my apartment is working fine. I tested it the other day when a pot of something got cooking a little too strong. I flipped on the exhaust fan, but it couldn’t keep up, even though it is vented to the outside. I know this to be true because when I’m standing at the stove, I feel a breeze, more than a draft, coming through the cabinet where the fan is mounted. But back to this thing of saving daylight. Somewhere in the Universe, there’s a bank for it, from which, come Sunday, Alaskans will start withdrawing deposits. And while we spend last year’s deposits to fish and create vitamin D around the clock, we’ll be saving this year’s sunlight for next summer. If anyone knows where that bank is, let me know. I’ve already figured out, it’s not SunTrust. I also wonder if somewhere in this grand scheme to save daylight there might be lessons for the government. You know, like saving (or taxing) while you’re spending to have enough for the next summer, and the next, and the next. I majored in biology and reluctantly taught chemistry for a year, but sometimes backwoods, horse-sense explanations are more fun than the scholarly versions, which sometimes turn out to be hocus pocus. 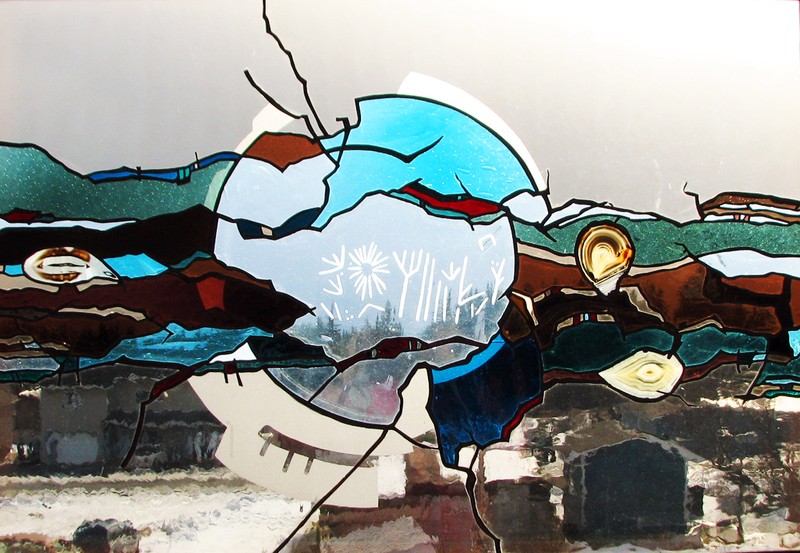 Like the translation of the West Virginia petroglyph that inspired this piece of stained glass. When I lived in southwest Virginia and had completed my study of gypsies, I got deep into petroglyphs and made a couple of trips to that neighboring state to see rock writing with my own eyes. That was in the mid-1980s, when the only explanation for their meaning came from a retired Harvard professor, a marine biologist and self-taught student of ancient languages who convinced at least a few people that the writing was Ogam, an ancient Irish alphabet with no vowels. He concluded that Irish monks who had traveled across the Atlantic around 600 A.D. in leather boats had incised the Ogam words in these stone outcropping in southeastern West Virginia. They must have ditched the boats somewhere in the Great Lakes area and come south, on foot, to do something. Maybe to give salvation to the Indians, who then would have not have been called Indians. Or maybe the monks were looking for their hillbilly cousins who had traveled across the Big Pond even earlier in the belly of a whale. Anyway, an article about the petroglyphs published in Wonderful West Virginia magazine included Dr. Fell’s translation of the petroglyphs and this one, he said, describes how a ray of sunlight beams through a notch in a rock and illuminates the stone panel precisely on the Winter Solstice, which in those days would have been Christmas. A few years after the article was published, an impressively credentialed scholar of ancient language pretty well reamed out old Dr. Fell, as some scholars are compelled to do when someone challenges their theories. This post comes from a mind that knows scientifically, unequivocally that dusting is futile. I remembered all of this petroglyph stuff when I stood this afternoon looking through the stained glass piece as the sun blazed through it. Better to ponder Ogam, Irish monks beating Columbus and a few other guys to the New World, my neighbor’s chicken house, and the energy of sunshine. Friday night. McNeil Canyon’s annual talent show and silent auction. Sam and his friend Ethan acted out a scene from one of the original Pink Panther films with Peter Sellers. I had downloaded Bobby McFerrin’s incredible version of the theme song for them, but the sound engineer (who’s also the very cool school principal) couldn’t find the on switch on my iPod, which was plugged into the sound system. But things worked out even better, because Beth grabbed the microphone and began humming the theme song. The entire audience (at least the adults) joined in. The boys didn’t miss a step. All the kids were amazing and completely unselfconsious performing in front of a pretty big crowd. I purchased a beautiful hand-knit cap in the silent auction. The most unusual item was the peanut butter-bacon pie purchased by the Tobins, whose son Peyton is one of Sam’s buddies. For dinner, after I got back to town at 9:30, I tried McDonald’s Fish McBites, and they’re delicious! Granted a lot of things would have been delicious right then, because lunch had been a not-inspired salad about noon. But, really, I love the Fish McBites. They’re Alaska pollock, coming from sustainable fisheries, and not greasy or heavily breaded. I came home, whisked together a cocktail sauce, and ate while I watched Woody Allen’s To Rome with Love. That’s a film I can’t recommend, except that Alec Baldwin is always fun to watch. Late bedtime. Saturday daytime. First thing, coffee (I love it) while I read online Writer’s Almanac, the daily meditation from Richard Rohr, and the New York Times. After that, errands: post office, bank; Safeway for Major Dickason’s coffee, fresh rosemary, and tulips; Sav-U-More for cranberry beans, celery, onions, garlic; Petro for fuel,now $4.30 a gallon. Had lunch with a longtimer friend at Mermaid Cafe, then browsed adjacent Old Inlet books (used, some rare) and bought a copy of Beluga Days by Nancy Lord, who’s teaching the writers’ workshop I’m taking at the college. I have at least 10 books in my reading stack now, and this doesn’t include reading for class. After that I tuned my autoharp and practiced “Campfire Dance,” a gypsy melody that I’m learning so I can play along with the group of women who gather often to play whatever instruments they can come up with. They are kind enough to include me in this. Fortunately the autoharp is completely drowned out by the other instruments (accordion, fiddle, piano, acoustic guitar, electric bass guitar, flute). In the afternoon, I had a hilarious Skype session with my sister Joy. After that, a fellow spiritual seeker and I got into an extended Skype discussion of Marcus Borg. By the time that ended, I wasn’t in the mood for Side Effects at the Homer Theatre. Instead I worked on research for the next major writing assignment that’s due March 18. I’m writing about the long dresses worn by Russian Old Believer women, who really stand out here because they’re the only people who wear dresses all the time. Everyone else–women and men–wears pants most of the time, except that many Homer fashionistas are wearing ski skirts over pants or tights. Just because they’re in style doesn’t they don’t look very good on everyone. Yes, some men do wear skirts, that is kilts, but only for special occasions. Sunday so far. After coffee and reading, lots of cooking: bean and red wine soup, enough to last for week, from a NY Times recipe; roasted organic chicken a la Ina Garten, enough to last for days. This is what happens when you’re cooking for one person. While the chicken cooled I walked to Bishops Beach. Good golly! I live here! Still can’t believe it. 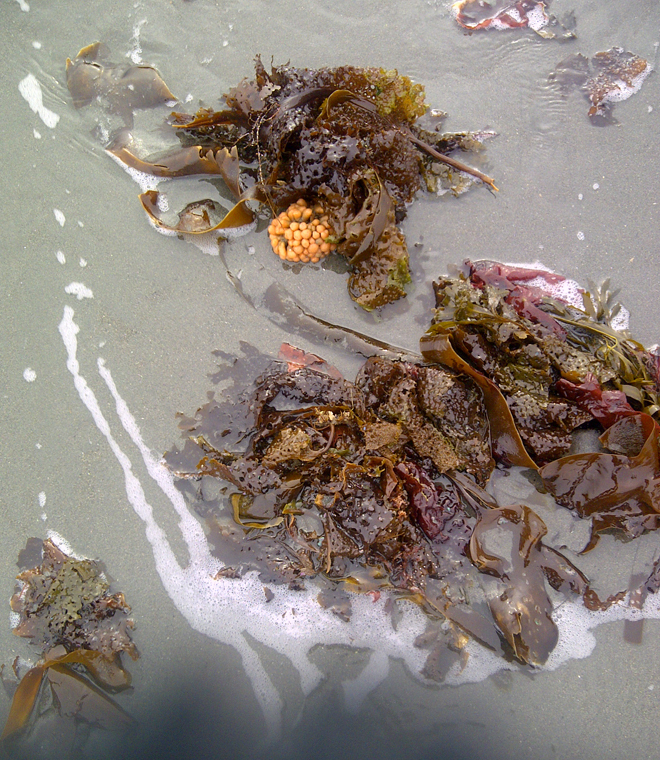 I love beach-combing, now more with my eyes than to gather sticks and stones and haul them home. Today I noticed a bright turquoise condom and a pile of cigarette butts. Also clusters of small orange balls — looked like little grapes or the salmon eggs we used to fish for trout in the South Fork of the Holston River. 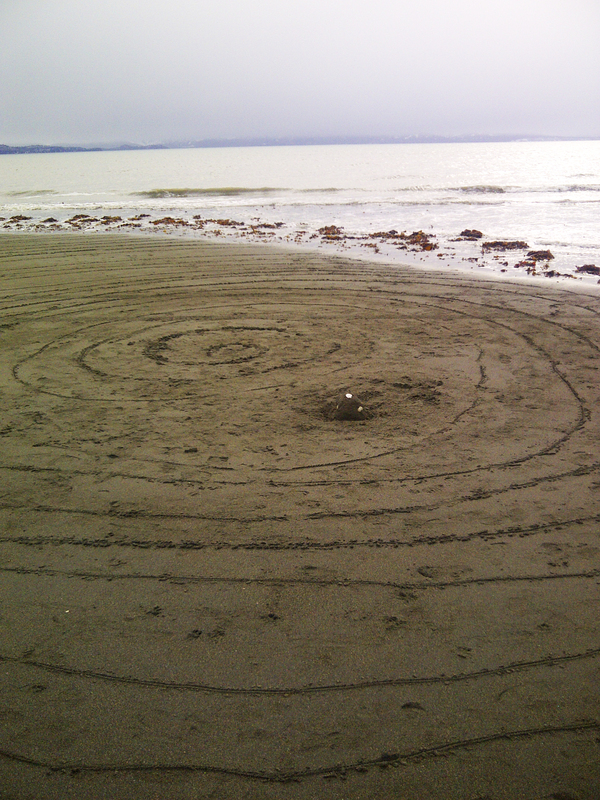 And a labyrinth that had been drawn in the sand. The tide had started to come in, and if I had waited for my walk I would have missed it. Chicken carcass is simmering on the stove now to make broth for more soups.Yoga practice is next in the little hall that connects the rooms of my apartment. It’s the perfect size and free of distractions. After that, I’ll have dinner — some of the chicken–and then maybe roll down the hill to the movie. Life is mighty juicy!